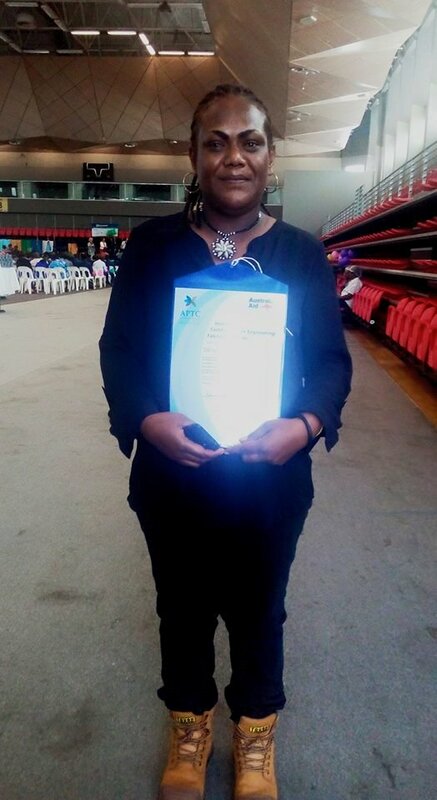 29 years old Dellan Laim from East New Britain and Manus is the only female that graduated from Certificate III in Engineering under the Australia Pacific Technical College (APTC). Dellan is a living testimony for those grade 10 leavers who think life ends when they fail their exams. After completing her grade 10 some years back, she took up some technical courses which landed her a job at the PNG Dockyard. While working with PNG Dockyard, she decided to do further studies and she took up Certificate III in Engineering –Fabrication Trade at APTC in which she attained her certificate this week. Dellan said the course was challenging especially working among male colleagues but her determination in completing that course and finding a better job pushed her on. Her pursue in attaining more knowledge is still there and she is now looking forward to be part of Port Moresby Technical College’s Apprenticeship programme. Looking back, Dellan is proud of her decision to take up courses at a Technical college when she failed her grade 10 examinations back then. “I realised that I couldn’t go further so I had to take another route to at least do something that will get me a job at the end of the day and that decision has brought me this far”. She said there is more to learn and more jobs available with Technical Courses which most school leavers don’t realise. Dellan is encouraging other young girls to take courses in Engineering which is very demanding in the workforce.